Not getting notifications all of the sudden--HELP! First let me say that I love your service. I've used it for years and it's awesome. Ok, my issue. I have a form set up that I've used daily for over a year now. I get notifications seemlessly and so do my collegues. However, I have not gotten notifications since the 21st. I asked my teammates and they said they have continued to get their notifications AND when I go online I can see on your site that we do have the new submissions. For some reason, I've just stopped getting the pushed out notifications. First thing I did was check my Mail for Junk....nothing. Also, I seem to be sending and recieving emails flawlessly other than the notifications from you all. So, I hopped on Jotform and did some checking. I made sure I was still on the email notification. I was. Run a test email and did not recieve. I set up another email notiication (add on) and made it my email address....tested....nothing. Baffled. One other point... I asked one of our employees about the issue and he responded " I have noticed when Im on the last page where it says fyi notes and press submit, sometimes it goes through sometimes it doesn't and when it doesn't go through I have to do my reports all over again. It seems like it might be taking a little longer to process." Not sure if there is anythingyou can recommend in that regard. But thought I'd mention. There's a glitch somewhere and I'm WRACKING my brain to figure it out. I SOOOOOO appreciate your help. Its the only difference between the 'good' notifications configuration, and the 'bad' one, so we must try that. Also ensure that noreply@jotform.com is in your trusted senders list. Please let us know if that helps. As regards the second issue. 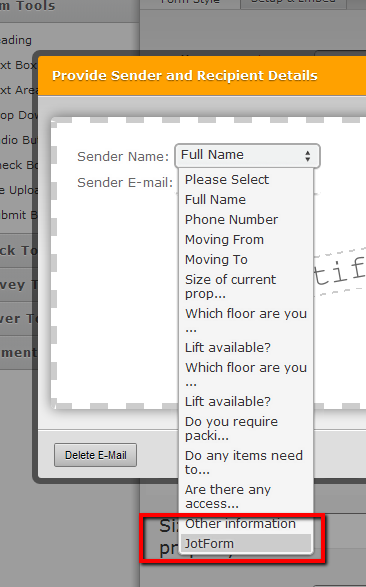 Please can you try using http://www.jotform.com/form/10125939283 instead of http://form.jotform.com/form/10125939283 as the reference address for your form. I realise that the 2nd issue is going to be a little hard to confirm if the change has worked, but please get back to us if you keep 'losing' form data in this manner. Include as much detail on what is happening as is possible e.g if there is error messages what they are, and browser type. they are keeping us in the dark. this is obviously happening to MANY users as you can see from most of the recent posts. I think they are doing a poor job of communicating to their customers that their form data from the last few days might not have come through and you should check submissions on this site. Just come out and say it ,YOUR EMAIL RESPONDERS ARE NOT WORKING AT THIS TIME. Please provide us with with details of your problems with email notifications in seperate forum posts. The developers are looking into this problem, but it isnt affecting every form/email address so we need users to report each instance & with what email address they are having the problem with. I will forward those posts to the developers for there immediate attention. Thank you for your reply and yes we have problem only with one of our forms name is quote your move. On you Email Notification setting please change Sender Name to JotForm. OK, thanks for checking. I notice you have changed the sender back to Email, can you please change it back to noreply@jotform.com, keeping the sender as JotForm, then doing a test submission. I am sorry to have you running around changing things like this, I just want to be sure of your configuration. Its helps everyone understand the nature of the problem. Thanks for your assistance & patience. OK kuku, thanks for checking those changes, appreciate that. I will escalate to the developers. Brandi, if you are still having issues with your email notifications after the change I suggested, please report back and I will make the developers aware of your specific problem. Your email address is blocked because of bouncing emails. I have cleaned your email address for now, but you should contact with your email provider about the situation. This is not related with any bug or anything about jotform. Problem is related with your email address. You have been also blocked because of bouncing emails. I have cleaned your email address from that block list but you should contact with your email provider about the situation. I have attached the fail message. The following message to <info@quo****rmove.co.uk> was undeliverable. This is a new form - and the test feature works, but of course sends no data. When I try for form embedded at my site - nothing, no data emailed to me. We have never had a problem with the other forms set up. Can you please have a look?